Have you considered this? placing a qualifying order is not the only way! Sale-A-Bration is quickly coming to an end 🙁 I have loved so many of the items in Sale-A-Bration this year. From Heartfelt Blooms and Blossoming Basket Bundle to the Party Pandas and the Epic Celebration, there was just something for everyone. While there are so many options of merchandise to get for free with a qualifying purchase, have you considered this? Free with a qualifying purchase is NOT the only way to save during Sale-A-Bration. Have you considered joining Stampin’ Up? If you have considered it, then you should act on it now. You’ll get 2 free stamp sets of your choice, any value, when you purchase the $99 Starter Kit during Sale-A-Bration. 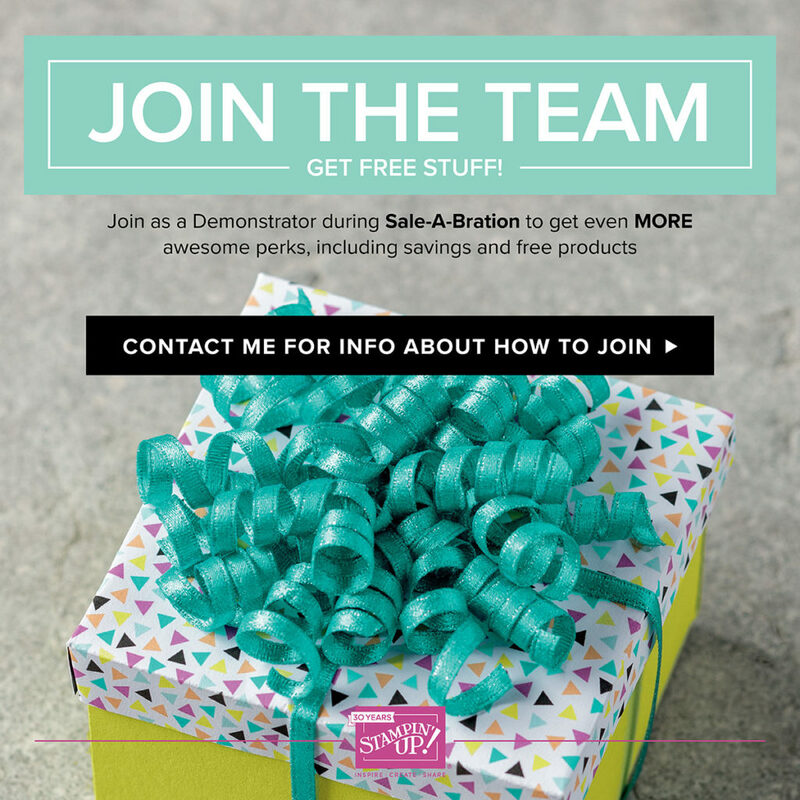 If you’ve never considered joining Stampin’ Up! before, let me give you some things to consider. First ,when you join Stampin’ Up! you get an incredible value in the $99 Starter Kit – $125 worth of products, and Free Shipping for $99. During Sale-A-Bration, add 2 stamp sets of your choice, any value. Second, you get all the perks of being a demonstrator, but it’s up to you if you want to join as a hobby demonstrator, or a business builder. Join just to get the discount off your favorite products, and be your own (even only) customer. Or build a business and earn a profit every time you make a sale. Imagine being able to contribute to your monthly budget by having an income doing what you love. It all begins with the $99 Starter Kit. My favorite perk of being a distributor is the early catalog reveal and pre-order. Join Stampin’ Up! now and be able to see the new 2018-19 Annual Catalog on April 9th rather than waiting for the June 1 release! A close tie for the #1 perk of being part of the Stampin’ Up! family is the community. Our closed, online groups have allowed me to make friends across the country, as well as the friendships I’ve developed stamping with others locally. Corporate events, like the OnStage event I’ll be attending in 2 weeks are just plain fun! Filled with excitement, swaps, prize patrol, early catalog release, learning and sneak peaks, it’s a time to be relished. And since it’s for demonstrators only, it’s an exclusive event. These are just some of the reasons you should consider joining Stampin’ Up! So whether you’ve been contemplating this, or you never thought of it, if you join before the end of Sale-A-Bration on March 31st, you’ll get the added bonus of 2 Free Stamp sets. That makes the incredible $99 Starter Kit deal, an even better deal! Click here to purchase the $99 Starter Kit and join the Stampin’ Up! family. Have questions? Contact me and I’ll answer your questions and help you decide if now is the best time for you to join Stampin’ UP!